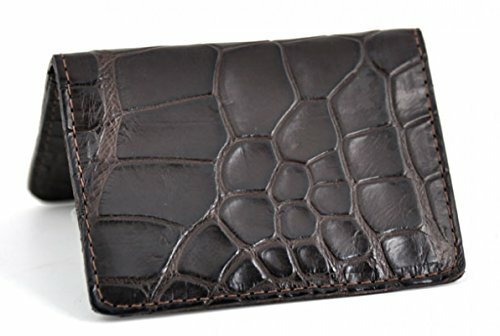 Our Italian handmade alligator hide small accessories are the finest quality and the perfect treat for yourself or a great gift for the friend who has everything. This beautiful card holder is guaranteed for life. It comes specially packaged in our linen covered hard case ready to hand someone you love. Shown in Walnut. Each case is unique as no hides are the same and no place on the hide is the same. Size closed/folded is 4"x2 5/8". If you would like us to send you an actual photo of your individual purchase, we would be happy to do so. CITES Certified. We STRONGLY support CITES (the Convention on International Trade in Endangered Species of Wild Fauna and Flora) which is a multilateral treaty to protect endangered plants and animals. We are licensed importers and exporters of exotic materials.